Now that we’ve addressed that part, let’s proceed with how the chat feature will help complete the return. 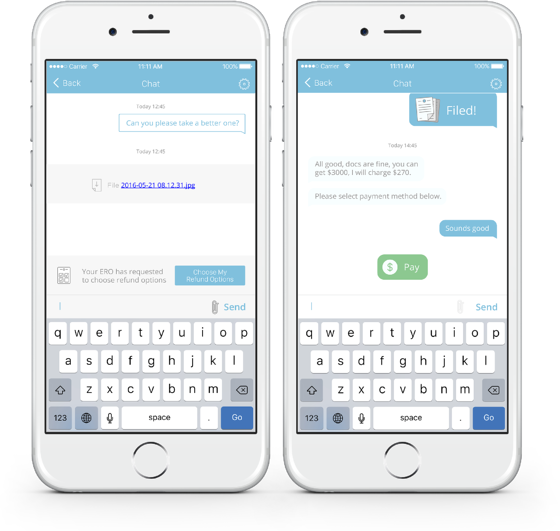 The main role of the chat feature is to help you address the cost associated to the return with your clients. In addition, you’ll be able to adjust parts and specific refund details of your client’s return. We’ve received positive feedback in how we’re breaking down the process, so let’s continue to do that with the chat section. After the preparers receive the taxpayer information, as we discussed in my previous post, they will have the ability to communicate with the taxpayer anything that needs fixing or changing. For example, if a taxpayer accidently puts $1 instead of $1000 in gambling earnings, the preparer can communicate the mistake with their client and fix it manually. After ensuring accuracy and finishing the preparation process, the preparer will communicate the tax preparation fees through the chat section. Each taxpayer case is different, so expressing the cost through here and being able to chat back and forth with taxpayer is ideal. All of this information will be automatically stored in the Refundo Dashboard. From the taxpayer side, they will be able to log into the app and see a summary of the entire process. The process includes: The amount of their refund, the amount paid in tax preparation fees, disbursement method, and their signature. Remember, the awesome part is being able to pull the information onto your tax software in order to submit the return to the IRS. We’ve been working hard to make sure this new feature is very simple to use, and is consistent with the design of the current dashboard. We kept the design consistent for obvious reasons, but more importantly, we focused on making it simple and fun. The idea is for taxpayers to feel like they’re doing their taxes the right way, and not feel overwhelmed by things that complicate the process. So now that you understand how it works, our goal is also to make sure you market it properly. What exactly does that mean? Well, we’ve implemented something else to make sure the app is an absolute success. Stay tuned to our next post where we discuss the best ways to market the Connect app!